Does anyone have any experience with the Rotopax Gasflask fuel carrier? 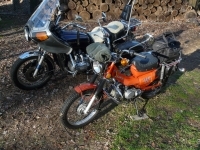 It is a heavy duty, 1.25 gallon plastic fuel carrier that mounts to motorcycle racks using its own hardware. 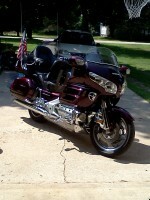 I am trying to determine if it will mount on a GoldWing trunk rack with the round bars for an upcoming trip to Alaska. That's 7 1/2 pounds of gasoline. I would make sure you have reinforced the inside of the trunk lid first, or that rack will be punching holes into the lid. Particularly with the punishing roads you are going to encounter in Alaska. I agree. 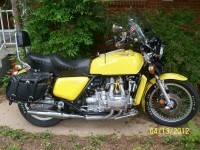 Goldwing trunk lids are well known for cracking from carrying too much weight on them. Mine already has a nice crack from the previous owner overloading it. Did anyone actually answer the question about the gas can? No experience just advice not to do it without reinforcing the trunk. Alwrmcusn I sure love the color combo of your trike. Not yet. I believe its a relatively new product. Just one more comment:.....I'm getting the impression that the trunk rack cannot adequately support even 7.5 pounds?? alwrmcusn wrote: Just one more comment:.....I'm getting the impression that the trunk rack cannot adequately support even 7.5 pounds?? This Gasflask clips to the rack to eliminate bouncing. On the website it shows the Gasflask securely clipped to a Harley Tour Pak Rack. 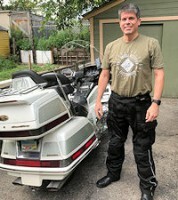 If the clips don't fit on the GoldWing rack, then it would have to be secured with straps and then you would run the risk of the bouncing you mention. Ah ha, I understand now. I am fairly new to the GW trike scene. My Venture's trunk rack came with two chrome metal strips to spread the load. Hannah and I regularly carried a large rack bag up there that might weigh 10 to 25 pounds. I will examine my Wings' rack and maybe make an alteration. We have several "luggage" required trips coming up this spring/summer. alwrmcusn wrote: Ah ha, I understand now. I am fairly new to the GW trike scene. My Venture's trunk rack came with two chrome metal strips to spread the load. Hannah and I regularly carried a large rack bag up there that might weigh 10 to 25 pounds. I will examine my Wings' rack and maybe make an alteration. We have several "luggage" required trips coming up this spring/summer. If you do not already have a trailer, perhaps this would be of interest to you. That is a nice looking trailer and it does look like a match to my trike. But $1500 is a bit outta my price range. I'm not really interested in a trailer but if I ran across one for the right price, I might just change my mind. Usually the trike trunk, top trunk and a rack bag is sufficient for our needs. We are usually 2-4 day trippers. We did do STAR days in Harrisburg a few years back when we had the Venture trike and ended up shipping a few items home (smile). I am not involved in the conversation about the trailer. In fact, I have a Uni-Go trailer. That is why I am looking for information about this GasFlask system. I got my answer. The Rotopax Gasflask will NOT work with my wing trunk rack. RoadRunner15 wrote: I am not involved in the conversation about the trailer. In fact, I have a Uni-Go trailer. That is why I am looking for information about this GasFlask system. Mount the Rotopax on the outside of your trailer. I saw 3 HDs with trailers that had just come back from AK trip with Rotopax on each of the trailers mounted on the side of the trailer behind the fender. They had Alumatrailers but you could do it on yours too, maybe on the front of the trailer? You could also mount the Rotopax on a piece of plywood that you bolt to the trunk rack for the trip to give a flat surface to mount on. Definitely want to strengthen the trunk lid. I fixed a friend's 1800 lid that he overloaded (45-50 lbs). He bought a couple ABS clear cutting boards which I cut to size and shape then heated with a heat gun to form to the outer lid shape, painted black to match the lid and mounted with 3M highbond double stick tape then the rack with the feet extenders bolting through the lid and board patches. That allowed him to overload the rack. It's what he wanted to do rather that buy a new lid. "I fixed a friend's 1800 lid that he overloaded (45-50 lbs). He bought a couple ABS clear cutting boards which I cut to size and shape then heated with a heat gun to form to the outer lid shape, painted black to match the lid and mounted with 3M highbond double stick tape then the rack with the feet extenders bolting through the lid and board patches." Would you have photos of that "fix"? I did a similar trunk-strengthening routine to both my GL!100 and my GL1500 trunks. I use simple cheap bulk ABS panel - the bonus being it's already black, and doesn't need to be fitted. I cut to fit, then heat the panels with a heat gun until they are soft, and push them into the inside top trunk lid so that they take on the shape of the lid interior. Once they cool, I then take ABS cement (basically ABS dissolved in MEK - you can find it in the plumbing section - I use Oatey Extra Special which works really well), put a thin layer on both the trunk lid and the panel, and clamp the panel into place until it bonds. The ABS cement actually chemically melts the ABS slightly, and when it cures, the panel actually becomes part of the trunk lid - it can never be removed. Unlike bonding tape, which just holds the reinforcing panel against the lid, bonding it to the lid in effect makes the lid thicker and stronger. Try REDA gas cans. They fit inside the saddle bag. Harley sells these, so they really must be vibration proof. You can order direct from the REDA site. BTW, your trunk has a carry handle in the picture, you can take it off and use it like carry on luggage? This was the way he wanted it done rather than on the inside ad there were cracks and holes I filled first. alwrmcusn wrote: Thank you, very informative. Yes you can, factory type, turn two spring loaded locks on the luggage frame, slide the trunk forward and lift up. If my vote counts... IM with buzzard...mount a can somehow to your hitch ONLY for your Alaska trip...yo DO remember the ford pinto gas tanks! Leave room for fuel expansion...and keep in mind that fuel is as slippery as oil [on tires] and you don't want to bbqd goldwings! buy the hitch rack of your choice and carry a small cooler/luggage on your weekend trips...keeps weight low and doesn't burden your tourpak! MY PLATE READS DVLSH...Not cause it's red...because of my sense of humor!